Beautiful headphones, planar magnetic, low cost. Fostex call them ‘open’ headphones but in reality they are ported. Thankfully this doesn’t leak as much sound as you would think. 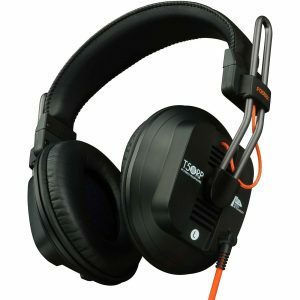 These headphones are what I am currently recommending right now. They have such great sound, flat tone, but are some what uncomfortable before swapping out the ear pads. My recommendation would be the SHURE HPAEC1540 ear pads. The Alcantara just feel wonderful against your head while keeping the sound the same. They offer three different models of the MK3. The T20RP MK3, the T40RP MK3, and the T50RP MK3. 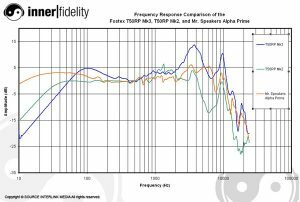 Inner Fidelity did a review of the T50RP MK3’s frequency response and its not too far off from the Alpha Primes. With a few mods you can certainly make them closer. As for pricing, they sit around the range of $149.99, but you’ll see them drop down to $100 with discount/coupon. Guitar center often sends out a 20% discount on products over $100, and this does apply. If they do go on sale, make sure to use the discount for an even better price! I have bad hearing, but these seem to do quite well with my ears. There’s one issue I’ve heard around the forums and it might be real where the left cup produces less sound due to the wiring. I’ve swapped the headphones around and have heard a difference in both ears but this can be fixed with modding. Speaking about modding, these things seem to be a fan favorite if you like to mod. Clay, tape, custom wood ear cups, you can do so much to change the tone of these. Some users create their own testing station to make a change, and see how the tone has been updated. Head-Fi has a massive thread about this. Great headphones for the price. Best entry level planar magnetic unit. Modding can unleash better sound to suit your needs.